Here we go again. 18 years ago a massive vote was held in Australia to determine whether the nation would remain tied to the British monarchy or become a separate republic. The media, major corporations, and the elites were certain of the outcome; it was to be a republic. Why, all of the opinion polls showed that to be the case. But events moved in an entirely “unexpected” direction when the stupid proles voted the wrong way. The push for a republic had been stopped dead in its tracks. The public had been asked and the public had responded – no republic. The great strategic mistake that the pro-republican camp had made was going in too early. You can’t convince a population made up of mostly Anglo-Saxon stock to abandon its own historical monarchy. That way madness lies. What you need to do is to bide your time and slowly bring in millions of immigrants who couldn’t give two figs about whether the country is a monarchy or a republic, just so long as they continue to get their welfare and can bring in all of their Godless relatives. Notice that the numbers of migrants given is net. The net refers to a part of a whole following a deduction. In other words, even though around 250k foreigners got in last year, a bunch of people already in Australia decided to make for the exit door. The 169,993 number is the total after deducting those people who looked around and decided that Australia wasn’t the place for them anymore. People like myself and the good wife. As I said yesterday, when the darkies are flooding your neighborhood the only option is to sell up and get out. So the pro-republic camp got the immigration issue sorted in their favor. But they needed someone to not only to continue to burn the flame but to be in a position to light it when the time was ripe. That man is the present Australian prime minister, Malcolm Turnbull who coincidentally was the leader of the push for a republic back in 1999. It’s very important to understand that Turnbull’s act of reviving the push for a republic is not meant to be a diversion away from the real problems that are ruining the country, such as expensive and unreliable energy and the aforementioned immigration. It’s not a diversion for the simple reason that the push for an Australian republic is the only reason that Turnbull got into politics in the first place. It was his motivation for knifing Abbott and stealing the leadership of the country. Turnbull is desperate to be the first president of an Australian republic, and he’ll be damned if all of his hard work over two decades will only result in some other grinning fool assuming the great prize. Watch these two resident idiots talk back and forth about the topic at hand. The discussion is simply about whether the Australian people would want to have a vote on the issue, as if the events of 1999 never occurred, despite Sky News rolling stock footage of the previous vote all those years ago. At the end there is some other fool who has been given a “job” by the prime minister to “travel around the country and consult with the Australian public and develop a plan”. How is it possible for this inanity to pass unchallenged? Australians did indeed have their say in 1999, and they rejected the idea of an Australian head of state. So what is with all of this talk of consulting with the Australian people to see if they want to have their say when they already had their say and they said it very loud and clear indeed. The answer lies in those immigration numbers. Because there are a great number of so-called Australians who weren’t around back then to have a vote. The quid pro quo was citizenship for votes. They got their citizenship but now they have to cast a vote so that Maclom Turnbull can becomes the first president of a nation that he has spent the last 20 years selling down the river for his own ambitions of power. Turnbull’s little flunky will indeed travel the country seeking out the opinion of the Australian people. But he will only be making a certain number of stops. These visits will be to key ethnic enclaves that have only come into existence in the last 20 years. Enclaves that have been entirely created in order to secure a vote. After that, the country be damned. Adam, love your work, but not sure why we wouldn’t want Australians to elect their own head of state? Shouldn’t we “grow up” as a country, cut the ties from the old empire, and become a republic? I imagine this would give us a stronger sense of who we are as a country, not to mention also give us a better standing in Asia…but I’m interested in hearing arguments to the contrary. OK, full disclosure here.I am English, living in New Zealand and near retirement age. What I think many “progressives” and others discount is the value and ingrained love and respect for “tradition”. People are basically conservative and tribal. Tradition is the glue that binds us into an “us”. Start discarding traditions, ceremonies and rituals and this destroys the sense of “we” as a nation. I am surprised that the Monarchy is still very much respected and loved here in NZ although this may be due to the people I associate with. The screeching of the perennially disaffected complaining about the Monarchy get the attention but at heart, NZ is a country largely derived from British stock with the same traditions and culture as Britain. They celebrate Guy Fawkes day here which is a mystery to me and their military is organised similarly to the UK. So you meddle with such societal glue at your peril. The result of the Brexit vote and other tendencies against the progressive mantra reveal this when the powers that be foolishly allow it. (IMHO). So mess with tradition but you are messing with a system that has stood the test of time, trouble and tribulation [Actually, alliteration always annoys, eh>};o) ] and works, provided you have a hereditary head of state that is trained in the role from childhood and places the good of the country above all else within the limits of their power. I agree with Adam that the result might be different this time due to the influx of immigrants that have no common traditions, language or culture (and indeed, with no interest in acquiring that culture) that could not care less about your culture. Their ancestors never fought and died for the country, its institutions, its culture and identity. Yours did. So why should they have any affection or loyalty to the country. I can see all of the West (including Europe, Australia and other places that have been “culturally enriched”) becoming like the St Sophia Mosque in Instambul. It was originally a Christian church in Constantinople but although physically it still exists, it is not a Christian church. As Dave below (comment time stamped JANUARY 3, 2018 AT 12:43 AM) it will be Australia in name only but I could rename Saudi Arabia “Australia”. It would not be the Australia we know in any way, shape or form. Bah! It’s too hot. I’m off for a nice cup of tea and a choccy biscuit. As sad as it is to say Adam, I think your idea to move was a good one. This is just further proof. I see no point remaining a citizen of ‘Australia’ if we become some ridiculous banana Republic. It would be the final straw for me. My ancestors swore oaths to King and Country to defend it. I would gladly have done the same if asked, but such notions today would be ridiculed. The Marxists to their credit have been very effective in brining this about. In actual fact, I do live overseas for work, and am home at the moment for Christmas. New years morning around 4am I was woken up by yelling (I should say screeching) by some new ‘aussies’ of the pacific Islander female variety. I looked out my window to see a giant thug they were with beating a white guy senseless on the ground, before attacking his friends too. The police arrived within 10 minutes and did arrest the guy, but the illiterate females continued to swear at the police for a further 30 minutes without repercussion. This is literally on the ocean, in the eastern suburbs of Sydney. For my non Australian kin, we are talking multi million dollar real estate. Little children were walking past the blood stained footpath the following morning on a beautiful summers day with no idea what had occurred, and their parents no doubt entirely oblivious that they have ensured that this scene will be a completely normal daily occurrence for their children in future. I am so disgusted by this country. I’m not wanted. Anglo Saxons are clearly intended to be replaced in this land, but a nation is not the land, it’s the people that inhabit the land. If my heritage and people are replaced, then my home will become just another scenically beautiful location on a map, devoid of any civilisation, with crumbling footpaths full of blood, just like the dumps that these new ‘aussies’ have moved from. You know, I never really cared much for the whole Republic vs Monarchy thing previously, although now it’s crystal clear. This to me is just another step in this process. Ye Gods! 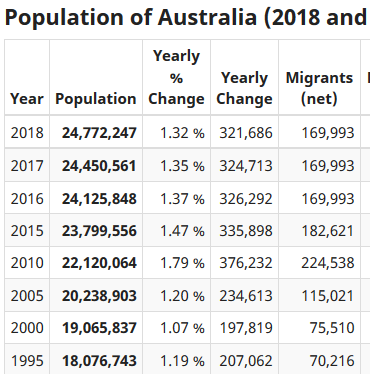 A country with Australia’s population and fertility deficits could get by satisfactorily with a net of 40,000 immigrant settlers in a typical year. An inflow of 250,000 is absurd. You know a republic is a rotten idea because during your last rodeo, Robert Hughes waddled back to Australia to campaign for it (having spent the previous 30-odd years stinking up London and New York). You should come up with a better procedure for selecting the G-G and Lt. Governors.